Do you have a cat? No? Yes? Well, I do have a cat and I could tell lots of stories. But this ain’t the point of today’s posting. I just like to share some YouTube videos with you. My dear introduces me into “Simon, the cat” and I can tell, those comic style short vids are so damn realistic! I laughed like hell, as I watched them the very first time. If you do have a cat or if you are experienced at least, I bet you will like them! If you neither have a cat nor are experienced, just give those vids a try and believe me: this is so damn true! The very first one: Cat in bed. This is my daily morning. Totally true! The next one: Cat on couch while watching TV. Believe me, every cat exactly behaves like this! And finally the last one: Cat wants to get inside. My cat isn’t allowed to go outside, but I bet this behavior is very authentic! 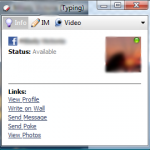 Do you use facebook and facebook’s chat function once in a while? Yes? And do you know Digsby? No? Not yet?! Well, you should! I used to use Trillian as Instant Messaging client like for years, but last autumn, I switched to Digsby: http://www.digsby.org/. It’s a high performant IM client with lots of features and (that’s what I like most about Digsby!) some great Web 2.0 implementations. 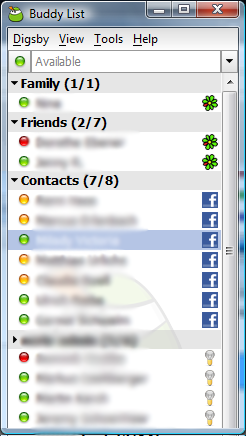 I guess, some of you might use facebook’s chat function. So did I but I did not like it that much. 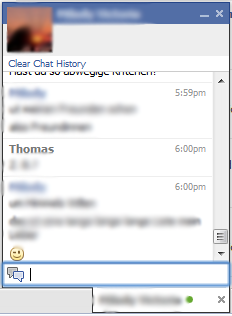 It totally wrecked my nerves to use my webbrowser for a chat. You may know the tiny little conversation windows as it appears on the very bottom of your browser tab. 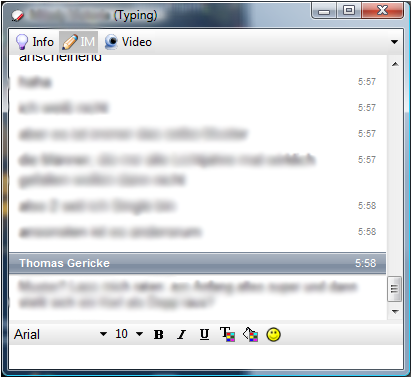 And that’s (at least for me) the first problem: conversations are bound to exactly this browser and this tab. If I open facebook’s website at work and forget to close the browser or the tab before I leave for home, I appear as online to all my friends, they write me and wonder, why I don’t reply – even if I’m online at home, but did not check into facebook’s website. It might be a great function – but I really don’t like it. I’m used to certain applications for instant messaging. Such as Digsby. Digsby has even more than a full Web 2.0 integration – you may use this IM client as a fully compatible and realtime instant messanger for facebook. Simply check “Tools” in the applications menu, then “Preferences”, then hit “Add IM Account” and select “Facebook Chat”. Once you double click one of your friends in your Buddy List, a conversation window opens – just like every IM client should behave. For me, this is a very useful IM integration. Check it out! I have to thank you! All of you, using unfake.it as URL shortening service! It’s been 100 days, since I faked the first URL with unfake.it – my very own URL shortening service. I started this project, ’cause I always forgot the names of all the other URL shortening providers, so I very quickly wrote my own application, which now is used every day by lots of users. What began for my personal use only, has now become a huge and important project. A few days after the initial launch – and even without heavy announcement, the first people started using unfake.it to shorten URLs. Using the bookmarklet, some friends and co-workers started using unfake.it and spreading the URL all over the world. Then, I implemented the magic preview function with thumbnailed images of the destination websites. Then I wrote a facebook application to add faked URLs and their thumbnails to your facebook profile. Those are just toy-like features, but I relly like them – as well as lots of users. I’m really looking forward to unfake.it‘s future. 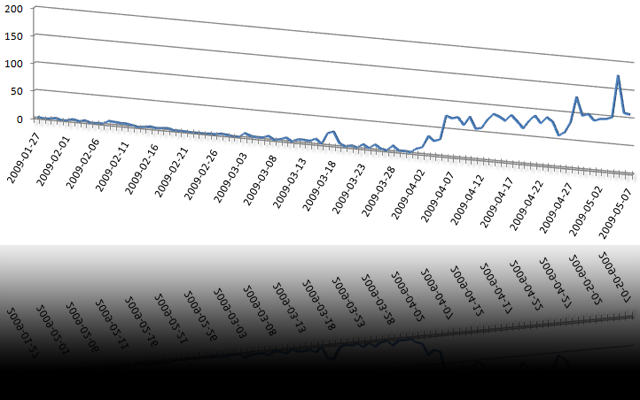 Sure, there is an increasing number of shortening services, but I guess, some of ‘em will disappear again.